In conjunction with the exhibition Felix Candela, the Wallach Art Gallery and the Avery Architectural and Fine Arts Library present a symposium on his life and work. Félix Candela is regarded as one the greatest Spanish architects of the 20th century. 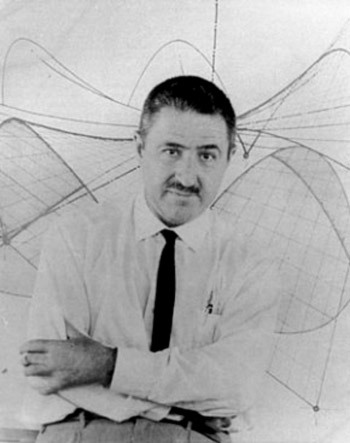 He is celebrated for his feats of architectural engineering that transform concrete into visual poetry with his structural design based on hyperbolic paraboloid geometric form. Barry Bergdoll, curator of Architecture & Design, Museum of Modern Art, will introduce the symposium and our keynote speaker Professor David Billington of Princeton University will present Felix Candela, engineer, builder and structural artist. his presentation will be followed by two panel discussions. The first, moderated by Angela Giral, former Avery Librarian, will focus on the relationship between politics and architecture. The second panel moderated by Professor Mary McLeod, Columbia University Graduate School of Architecture, Planning and Preservation (GSAPP) will take up the discussion of Candela’s legacy. Closing remarks and presentation of the exhibition will be delivered by Professor Juan Ignacio del Cueto, of UNAM, Mexico. Additional speakers and program details. Exhibition opening and reception immediately following. This entry was posted in Drawings & Archives, Exhibitions, Uncategorized on January 30, 2012 by Ted. Hoppner, Beechey, Fisher, Lavery: Researching Columbia’s Portraits.